So in case you haven't stuck your head outside, or don't live in the western region of North America, the weather has been unseasonably warm and dry. 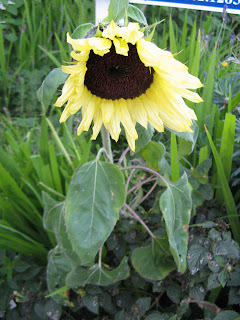 So warm and dry in fact that my neighbors yard has a volunteer sunflower! Not the mightiest of sunflowers, only about 2 1/2 feet tall, and already looking worse than in this photo from a couple days ago, but still, very strange. The weather is finally supposed to start to cool, and rain is forecast for the middle of next week, so I'm off to the local pool to enjoy it while I can.